Optic neuritis is an inflammation of the eye?s optic nerve. In order for you to see, the optic nerve carries nerve impulses from the eye to the brain, where they are interpreted as images. 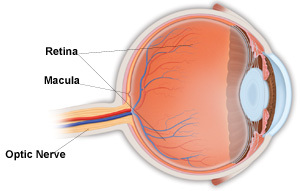 Damage or infection of the optic nerve can affect vision significantly. The symptoms may get worse with heat or exhaustion, particularly when exercising or taking a bath. If optic neuritis goes undiagnosed and untreated, the symptoms may continue to get worse. perform other tests such as computerized tomography (CT) scans, magnetic resonance imaging (MRI) scans, or visual brain wave recordings. In most cases, however, optic neuritis occurs with no known cause. For some patients, a medication called corticosteroids may be used to treat optic neuritis. In most cases, vision will either improve significantly or return to normal. Some patients, however, may not recover their normal vision, particularly if they have a pre-existing condition such as multiple sclerosis. Although some people recover normal vision without any treatment, it is imperative that you consult your ophthalmologist to determine the cause of optic neuritis so that you can receive appropriate treatment and avoid permanent damage to your eyes.